GDS Updates, Solicits Input from Community on New Campus | Tenleytown, D.C.
Posted on July 23, 2014 by Tenleytown, D.C.
Head of School Russell Shaw and president of the Georgetown Day School Board of Trustees Michael Gottdenker welcomed roughly two dozen members of the Tenleytown community on Tuesday evening for a discussion about the school’s plans for its upper campus. 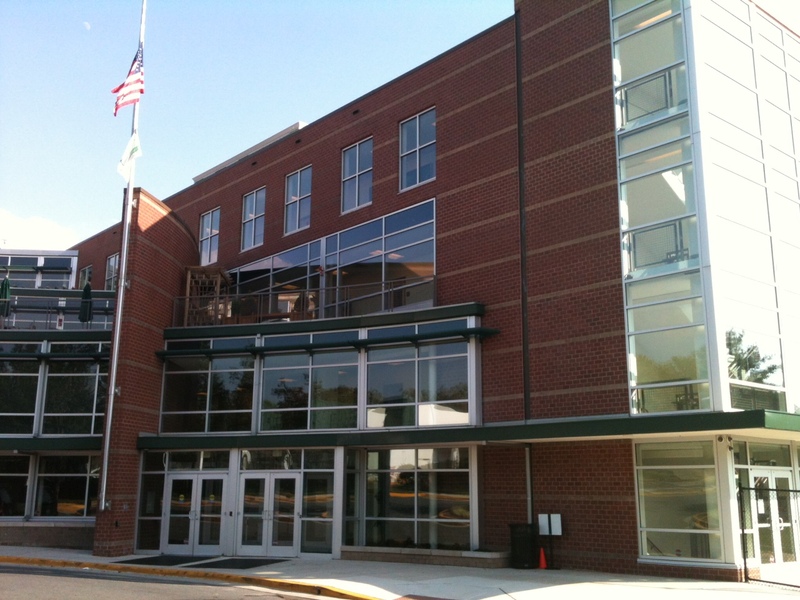 In June the private school purchased the Safeway and Euro Motorcars Volvo properties that adjoin the high school on Davenport Street in Tenleytown. What the new school campus will contain and look like is still quite murky, though. Shaw frankly admitted that GDS bought the Safeway and Euro Motorcars properties without a firm plan, other than to move its elementary and middle schools from MacArthur Boulevard to Tenleytown. The school has engaged a traffic planner to assess the impact of adding 575 students to the Tenleytown campus (the combined student body is expected to be near 1,100), as well as evaluate traffic management strategies and the potential use of public transit. Currently, 40 percent of GDS high school students use Metro to get to school. By early fall, Georgetown Day hopes to bring on a master planner with experience working in Washington, DC and expertise in developing educational as well as mixed-use properties. The majority of the academic and administrative facilities would be located on the Safeway parcel, while a mix of residential and retail space is envisioned for the Euro Motorcars property. GDS anticipates that it will take five to seven years to plan and develop the new 10 acre campus. As part of the planning process, GDS is looking for community input. The needs of its students and faculty will take primacy, but Georgetown Day says it intends to build synergies between the school and the surrounding neighborhood. Shaw has already received suggestions from residents for the inclusion of accessible green space, a playground, playing fields, meeting space, a speakers series, and an outdoor fountain that would be available to members of the community. No promises are being made, but he encouraged residents to keep sending suggestions. Constructive concerns are also welcome. Emails can be sent to TalktoGDS@GDS.org. Although GDS has only notionally begun to consider the future of the Volvo dealership, Shaw indicated that attracting some type of grocery store to the site is at the top of the school’s wish list. As part of the sale agreement, GDS is prohibited from bringing another grocery store to the Safeway site. Safeway pushed to extend the prohibition to the second property, but GDS negotiated for an allowance for a grocery store of up to 18,000 square feet at the Euro Motorcars site. For reference, the current Safeway has 34,000 square feet while, according to Shaw, the typical Trader Joe’s is approximately 12,000 square feet. In the meantime, GDS would support retaining the current Safeway as a tenant for as long as possible. Safeway currently has a 10-month lease which expires in early April 2015. Shaw said that ideally Georgetown Day would like to see the store remain at the Davenport Street location until the school is ready to begin construction. Safeway is not yet ready to make a long-term commitment, however, until the merger between Safeway and Albertsons is complete. For more information about Georgetown Day School’s plans for the Tenleytown campus and to sign up for regular updates, visit the school’s website at http://www.gds.org/CampusPlanning. I asked them for some help with the community in the past and was basically turned down. When you have the big lawyers kids going to this school it’s hard to do anything. I’ll be watching….